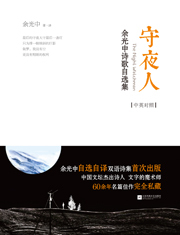 This collection includes more than 80 poems written by Yu Kwang-chung spanning from 1959 to 2014. This collection includes more than 80 poems written by Yu Kwang-chung spanning from 1959 to 2014. His poems combine Chinese classical literature and Western modern literature, and have been translated into English by the author himself. As a poet and writer, the Nanjing native is highly regarded on account of his prolific writings that have spanned more than five decade.